Well, this is awkward. I've abandoned this space for close to three years. Three crazy packed years with increased responsibilities at work and at home. But things have quieted down and I have that extra space back in my life. To breathe. To workout on a somewhat-regular-basis. To cook. And to blog. So, I'm back. And I hope you will come visit and comment once again. It feels good to open up my kitchen to you and to share my recipes and photos. Thanks for stopping by! I will introduce this recipe with a disclaimer. I am a self-proclaimed kale addict. Raw kale especially. And with kale season in full swing, there's no stopping me. I usually prepare it 101 Cookbooks style, but lately I've been branching out. Sometimes even way out. If you don't like kale, there's nothing for you here. Except maybe a few short words of support and encouragement: I won't hold this against you. Come back next week for something less green and less raw. In the meantime, could I convince you to give it a shot? Would it help if I admitted that I ate more than half this salad (yes, it is supposed to serve six) on my very own? 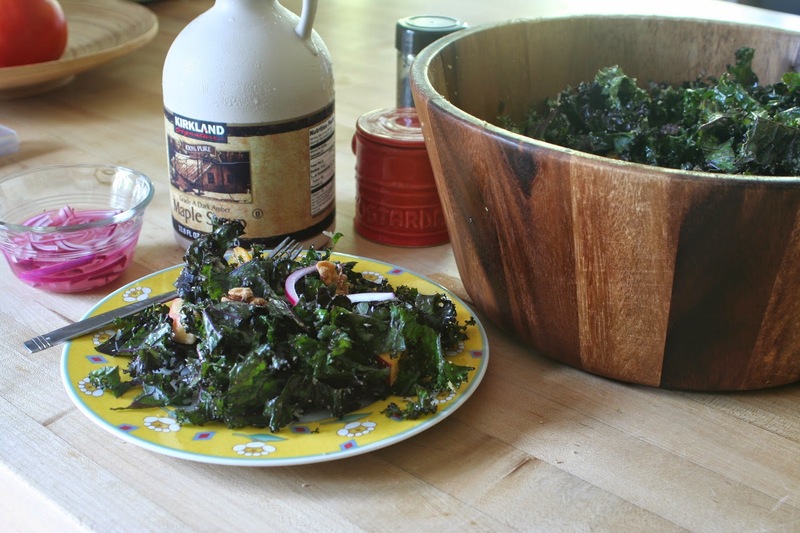 Like most raw kale recipes, this one enjoys a few minutes of massaging and relaxation. Who doesn't, really? In a large salad bowl, combine the olive oil, vinegar, maple syrup, salt, pepper, and spices. Use a fork to whisk well. 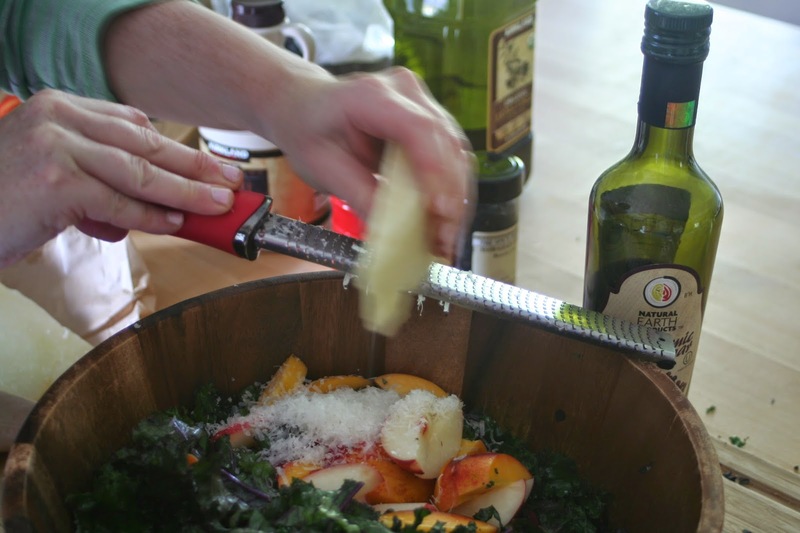 Use a chef's knife to cut the kale into ribbons. Put them in the bowl with the dressing. 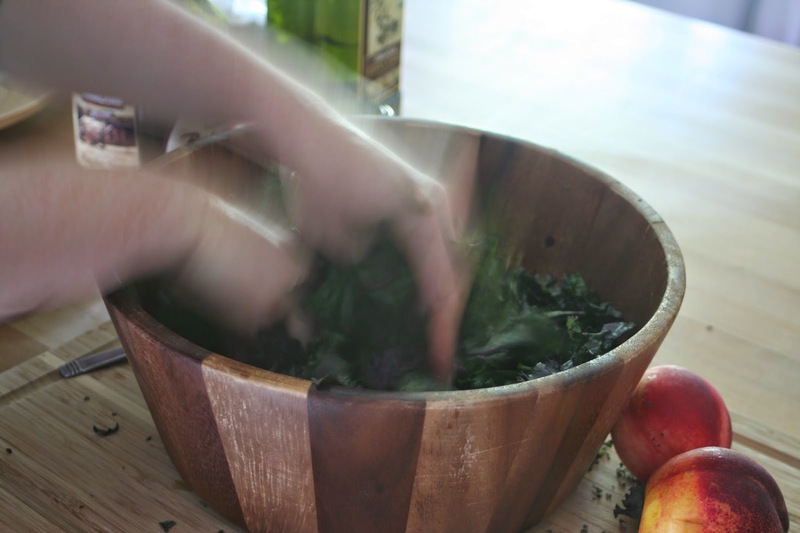 Use your hands (wear gloves if you like) to massage the dressing into the kale until it's well coated and you can feel the kale softening and wilting a bit. This will take 2-3 minutes. Don't skimp. Let the kale rest. Preheat the oven to 350 and toast the walnuts for about 7 minutes, till fragrant. When they are cool, chop them coarsely and put that on top of the kale. Meanwhile, slice your nectarines thin and put them on top of the kale as well. Cut the onion into thin slices and put them in a bowl or cup with enough vinegar to cover them. (This takes the bite out of the onion.) Once they've been resting for about ten minutes, drain and discard the vinegar. Put the onions on top of the kale. Last, put the cheese and bread crumbs into the bowl and give it a good toss. Eat fresh. If you have any left, it'll keep nicely for a day or two in the fridge. Thanks, Kelly. Yes, it was an inspiration (based on what was in the fridge) and it worked SO well. Thanks for stopping by, Kiki! Sorry you are deprived of the pleasures of kale! you know i have tried pear with kale and green apples but never nectarines- this is such a great idea and what a delicious salad. Welcome back and with this wholesome late summer salad! 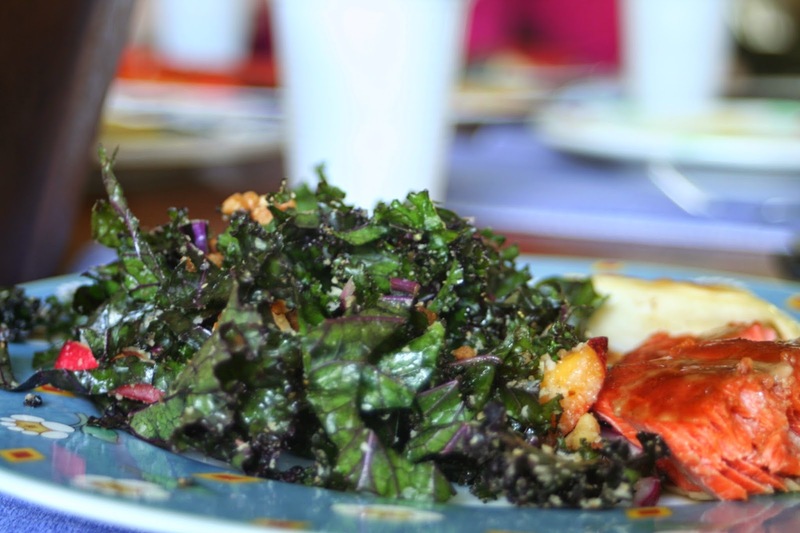 I love the combo of stone fruit and super food kale! Thanks, Angie. Yes, it was a lovely combination! Thanks for stopping by! Welcome back Rivki! It's great to see you blogging again! I love your salad - such a delicious mix of sweet and savory flavors! Thanks, Reeni. Yes, it's the first time I've tried fruit with kale. It was wonderful. Thanks for stopping by. It's good to be back! 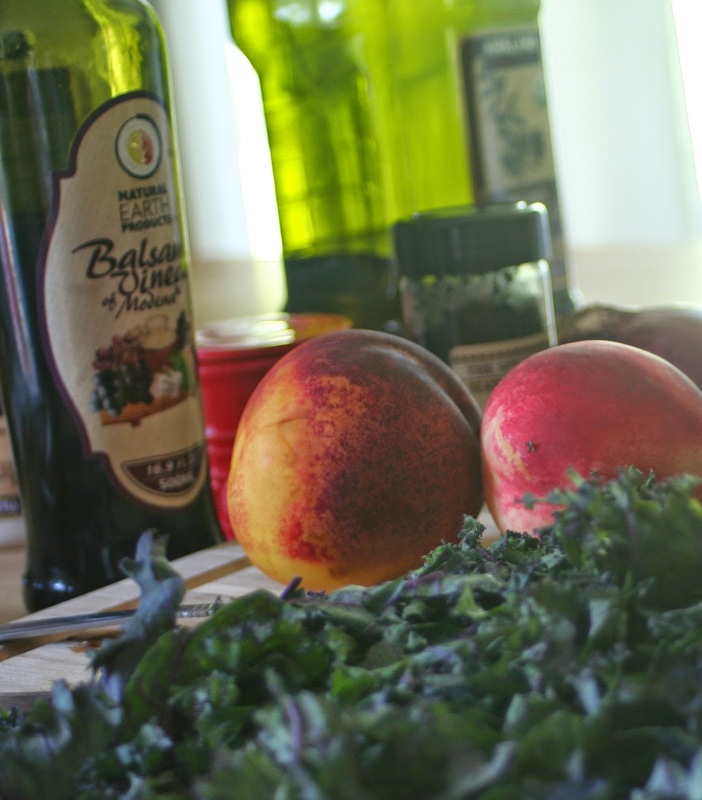 I love the idea of nectarines with kale salad. And, wow, welcome back! You have been missed! Thanks for your kind wishes Laura, and for stopping by! It's good to be back. Welcome back! It's exciting to see you back here - I know it's been about three years because your's was one of the first kosher blogs I found back when I started my own blogging journey! Thanks, Miriam. It's great to be back! I have SO missed blogging!